I have often been asked about the relevance or value of indepth case studies in local contexts when surely (according to many) any serious policy change can only come from more systematic (such as quantitative surveys) of many cases. There is no denying the power of numbers, but numbers alone are unable to construct knowledge or truth about phenomenon which may be very hard to capture in a survey. A firm believer in the power of stories and ethnographic fieldwork I continue to challenge the number logic. 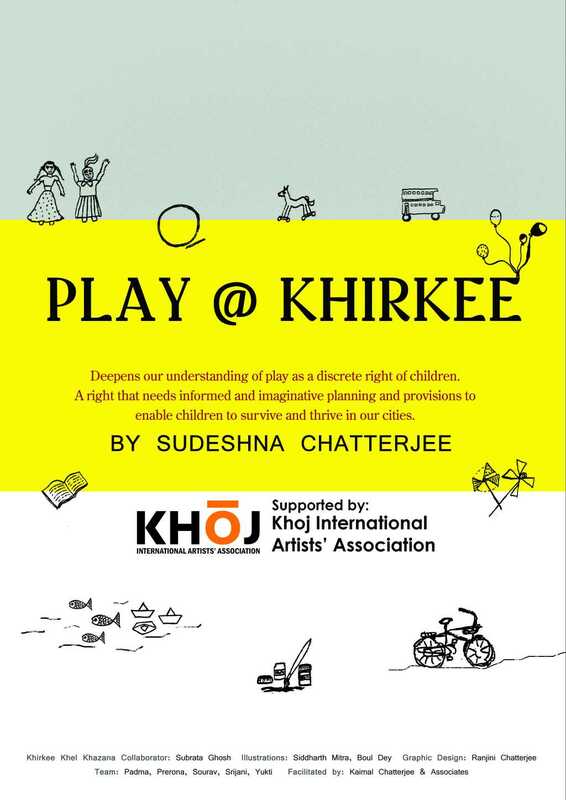 Play@Khirkee was another such indepth exploration of community life through ethnographic means. It allowed me to deepen my understanding of play in local urban space. And it also informed an international audience. IPA (International Play Association) for the last four years had been working hard to elaborate and enhance understanding about children's right to play. It had held several global consultations along with other like minded organizations with the support of the Bernard van Leer Foundation. Finally this year IPA had been able to convince the UN Committee on the Rights of the Child to prepare a General Comment on article 31 of the UNCRC. Why a general comment? There had been some discomfort with the lack of clarity among the constructs represented in Article 31 of the UN CRC such as play, leisure, recreation, sports etc. Often these terms are used interchangeably and therefore policies flowing from this article are equally muddled. "A General Comment is an official statement adopted by the UN Committee that elaborates on the meaning of an aspect of the Convention that seems to require further interpretation or emphasis. The aim of the General Comment is to increase state accountability. Drafting a General Comment is a huge task involving an elaborate international process. IPA to its credit has embarked on this process and assembled an international Working Group that will help to draft the General Comment in consultation with a panel of experts. I have the privilege of being invited to serve as a member of the international Working Group. This brings me back to the point of local vs. global studies. I do have a large body of work on children's environments but I had never only focused on play as I did in Play@Khirkee. This very indepth local study contributed to my keynote speech at the IPA 50th anniversary conference as well as showcased to the world how Indian children play and make sense of local places. As a direct consequence of that IPA invited me to join the international panel drafting the General Comment to deepen understanding of play at a global level. The world indeed is more glocal than one had imagined! And a two thumbs up for indepth local studies! The word khirkee in Hindi means window. When I presented Khirkee as a case study in my keynote address at the 50th anniversary IPA World Conference in Cardiff, I was in fact offering a window for looking at children at play in India to the world. An audience of 450 delegates from 55 countries saw the landscapes of play in Delhi sketched on a giant screen. The playmaps that we developed for Khirkee were a big hit. It graphically portrayed places of play and play deserts in a neighborhood and highlighted the constraints to play. I introduced Play-on-wheels at the end of the presentation. 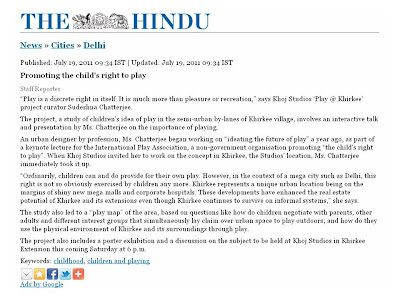 Later, many people congratulated me; what was interesting that each had taken away a different piece—the historic analysis of evolution of places for play in Delhi resonated with some, while others liked the policy analysis, but most were fascinated by the indepth study of play in Khirkee and the innovative playmaps. This was perhaps the best conference I have attended, certainly the most joyful one. Excellent keynotes, interesting workshops and paper presentations, ample networking opportunities, overall a fantastic experience. Play Wales, the organizers should be very proud of their achievement! One of the heartening takeaways for me from the IPA conference was exposure to national play strategies in the UK with funding available at local levels to promote better play opportunities for children. It tells me that children matter to these governments. And children’s play is considered a significant activity worthy of national policy attention and funding. Tim Gill very generously sent me the Supplementary Planning Guidance: Providing for Children and Young People's Play and Informal Recreation that he had coauthored for the city of London. Such guidance has to be followed for making play provisions while developing new areas in the city. I feel I have to publicize these global trends in India particularly to groups working with children but still shy about advocating play as it is not a “survival” issue. But it is a survival issue. It is perhaps the only asset a deprived child has to survive and thrive everyday despite the harshness of life. The basic premise for developing Play-on-Wheels was creating inclusive play experiences for children in neighborhoods by intervening not only in space but also in time using loose parts as tools for free play under the supervision of play workers. Well, in Cardiff, I witnessed all this in action at the Make a Noise for Play Festival that took over a large city park next to the Cardiff castle and unleashed free play. Take a look. Play@Khirkee led to an interesting collaboration between me and my friend Subrata Ghosh, a Calcutta based architect and a man of immense talent and patience. We called this collaboration “Khirkee Khel Khazana” or Khirkee’s Play Chest. KKK provided a space to ideate the future of children’s play in Khirkee through community action and KHOJ support. 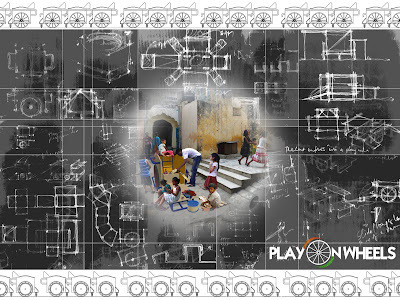 What is an inclusive playground in the Indian context? A bound physical playground particularly with large investments in landscape inadvertently exclude children from poorer backgrounds. How do we make play spaces accessible to them? How do we tap into their inherent creativity and resilience to allow new forms of play to flourish? How do we get children with structured routines and strict supervision to loosen up and play freely? "Loose parts as tools for free play"
Khirkee Khel Khazana or Khirkee's Play Chest incubated the idea of the Play-on-Wheels that come down different Play Tracks in the neighborhood to park at different Play Stations to bring play to the immediate domestic open space of children who under the guidance of a Play-Pal (local youth) form their own play spaces with whatever is available inside the Play Trolley/Cart/Box. 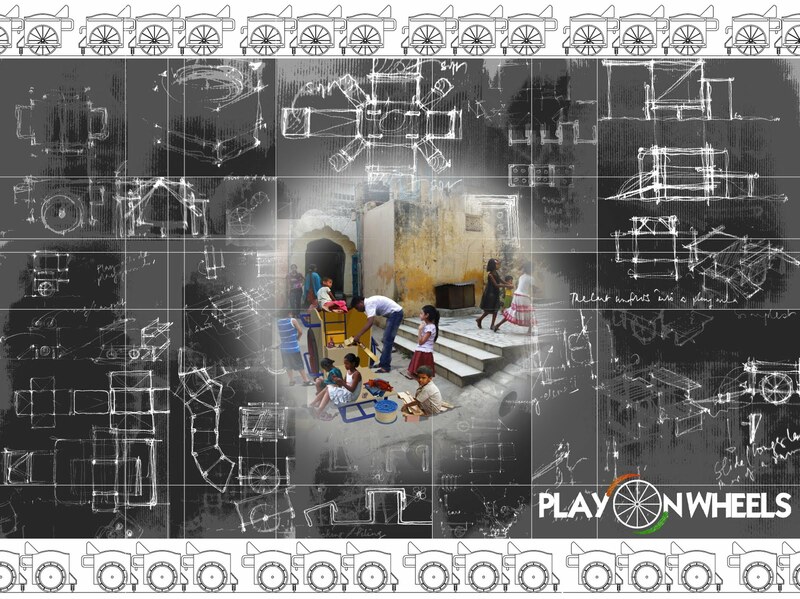 On a given day more than one POW unit can be mobilized by KHOJ that houses the Play-Garage. This way children can reclaim the urban space of their neighborhood as their playground under the helpful supervision of young adults who bring to their doorstep, streets, parks, plazas and other open spaces the opportunity to play freely and imaginatively without fear or prejudice. Khirkee is a special place for children. I have seen more free and imaginative play unfold here than in any other neighborhood in Delhi in a long time. Children in Khirkee have several places to choose from to play in their everyday environment. This ranges from the manicured garden like setting inside the large Khirkee park to the dusty barren rectangular DDA park, from the vast rough grounds of Satpula to the sunken rock strewn open spaces around the Khirkee mosque, which is a (un)protected monument. Of course in addition to these open spaces and parks that are typically used only in summer evenings, the large nearly car free streets near home, squares and courtyards offer another layer of immediate closer home anytime play spaces for children. Play in streets using construction materials. These boys were sailing this ship to Japan! However, not every space affords or allows free and imaginative play. These are typically to be found in places that have ample loose parts such as rocks, stones, scraps, construction waste, plants and weeds etc. or malleable parts such as soft or wet earth, water. In Khirkee places that had these features and allowed children to engage with the physical environment through play were the rough grounds of Satpula, the sunken rock strewn open spaces around the Khirkee mosque and the dusty barren rectangular DDA park that allowed access to the children from Panchsheel Vihar. The children to the left of the picture are busy making "aloo chaat" by making potatoes out of clay and other "chaat" ingredients. The children to the right of the picture are engineering a water channel to connect the many puddles that had formed after a nights rain in the rough grounds of Satpula. Radha making her little garden with loose parts in the rough open space outside the Khirkee Mosque. The largest and only open space that had received considerable landscape design attention, care and strict everyday supervision, is the one place where children have to observe the most rules. This is also the place with the most limited repertoire of games, as recounted by children, among all other places in Khirkee. A gentleman comes around at 6pm everyday with a thick wooden staff in his hand. He is the self appointed custodian of the Khirkee Park. He yells at children and orders them off the grass. The children have mastered his routine. They sit down on the raised platform of the fountain or on the ground near it where the gossiping mothers squat on the ground. This man also seeks out adults who he knows does not live in Khirkee village and asks them to leave the park. The resident’s welfare association (RWA) of Khirkee of which this man is an active member clearly wants to protect their investment in the designed landscape of the park from children’s play and outsiders. The enemy of play in Khirkee Park! Perhaps inspired by the "enemy of play", one child during a workshop, where children designed their dream playground with whatever they found in their surroundings, made up this story for a puppet show. "I want to say that there was a very cunning king who used to torture people. So one day one boy got very annoyed and went to kill the king. For making these puppets, we need to cut this sheet into their shapes and tie strings to their heads and thus our toy will be made for playing." What chance does free and imaginative play have in designed landscapes? None it would seem from the experience of children’s play in Khirkee. Well-designed and well-cared for landscapes in designated parks curb play in any form at least temporarily when adult supervisors actively prevent children from playing. According to these supervisors and framers of park rules, parks are meant for walking along designated paths or sitting quietly in pre-approved areas to enjoy nature. But the worst thing about designed parks is the lack of inclusiveness; poor children from nearby slums have no hope for access in the green paradise of the Khirkee Park. These children enjoy access in the park adjacent to the DDA flats to the north of the Khirkee Park. This DDA park is also a designed park—a dusty, barren rectangular patch with high boundary walls, a few peripheral trees and a short path connecting the two centrally placed gates on the longer sides. Children have access here because there is no self-appointed supervisor nor has a RWA made an investment in ornamental landscape and gardeners in this park. However a group of women from the DDA flats are currently threatening to take over the west half of the patch for laying a lawn. This is the area where free play unfolds. Middle class children from the DDA flats who do not join the cricket gang on the eastern half of the patch reported 12 different games that they play here. The children who come from the slum pocket to the north of the park, use the same western half of the patch to play 32 different games. More importantly both the middle class children and the children from the slums have the freedom to manipulate the physical environment of this park through play. They also have the freedom to bring in loose parts from outside here for creating play territories and landscapes on the barren patch. And it is a fact that across the landscape of Khirkee we found the poorer children to be much more innovative in their use of the affordances of the environment to create new games and play territories. To put a spin on George Bernard Shaw: “Some children see things as they are and ask why. Others dream things that never were and ask why not”. We found the children, who come from homes battling with different forms of poverty and subject to often acute material deprivation, to be most curious about the world and creative in their use and manipulation of the urban environment. They not only dreamed, but actively made their own worlds with whatever was available in their surroundings. The mother of these two young children sells corn in the cob outside the park where they were photographed. These children used a stick lying around to devise a game that we had not seen other children in this park play: riding a horse! Play = Parks? That’s what they say, but what do you see? 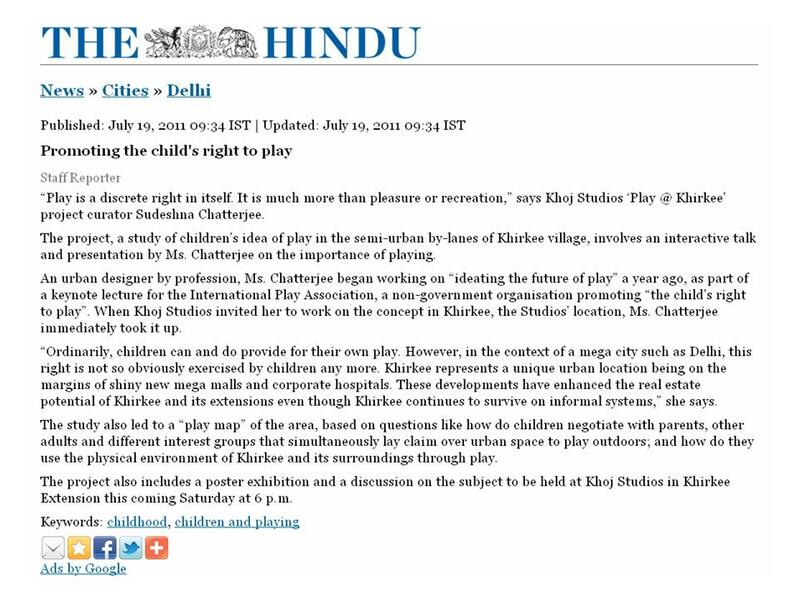 A well known Delhi NGO has recently concluded a survey on the right to play in Delhi. Their aim was to understand the conditions and resources for play and attitudes towards play. However what the study actually did was to map the perceptions about parks in local areas. There is an underlying assumption that seems to have guided this unique study: parks are the legitimate and most desirable play spaces for children in local areas. 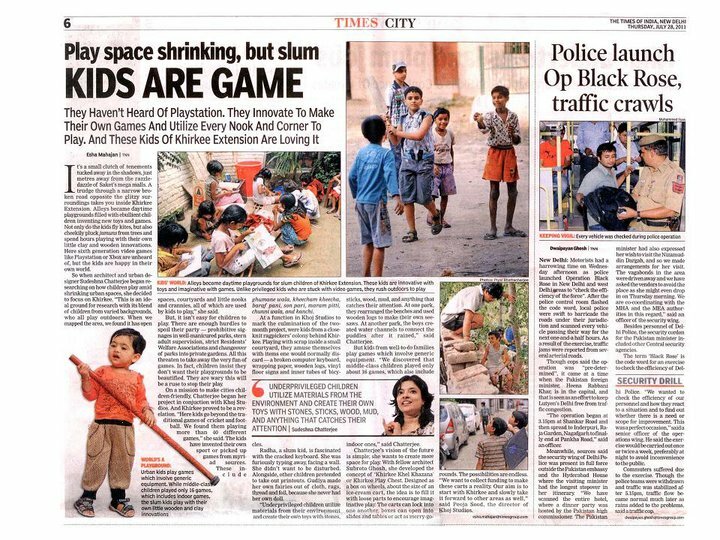 This is surprising because NGOs such as this one have done phenomenal work with children growing up in the streets who survive and thrive through play in streets. Some of the findings of this study are indeed very illuminating, for what the children seem to be asking for are actually systems for keeping the park environments clean, coaches to train them in sports and games and presence of adults. Very clearly children want to be part of a landscape that is inclusive and clean and not specially fitted with children’s equipment only. This study which promised a lot, made me wonder. Why is there such an obsession with parks? Why are parks considered the only appropriate landscapes for play at the local level? Particularly in the Indian context where historically children played in the streets, courtyards, squares, near monuments and continue to do so in most parts of the city. Delhi, the most planned and greenest city in India has about 19% green cover and thousands of parks dotting its neighborhoods. But these local area parks are really the preserve of post-masterplan landscapes which borrowed ideas from the colonial planners of Lutyen’s Delhi, the garden city and Calerence Perry’s neighborhood concept. Interestingly, Perry’s neighborhood unit evolved out of an earlier idea in which he tried to provide a planning formula for the arrangement and distribution of playgrounds in the New York area. However, Delhi’s planners were not interested in any planned distribution of play spaces and facilities but embraced the idea of a neighborhood park as a lung space with some children’s facilities tucked in a corner. 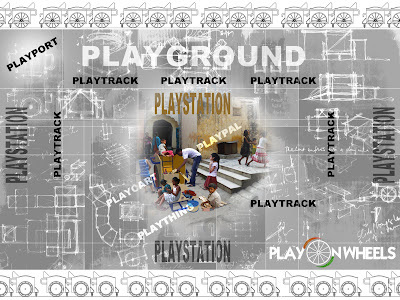 In fact there is no designed “playground” in Delhi. The Children’s Park at India Gate was the closest Delhi had as a city level equipped playground for children. This in its refurbished avatar continues to give much happiness to children across the national capital territory of Delhi. 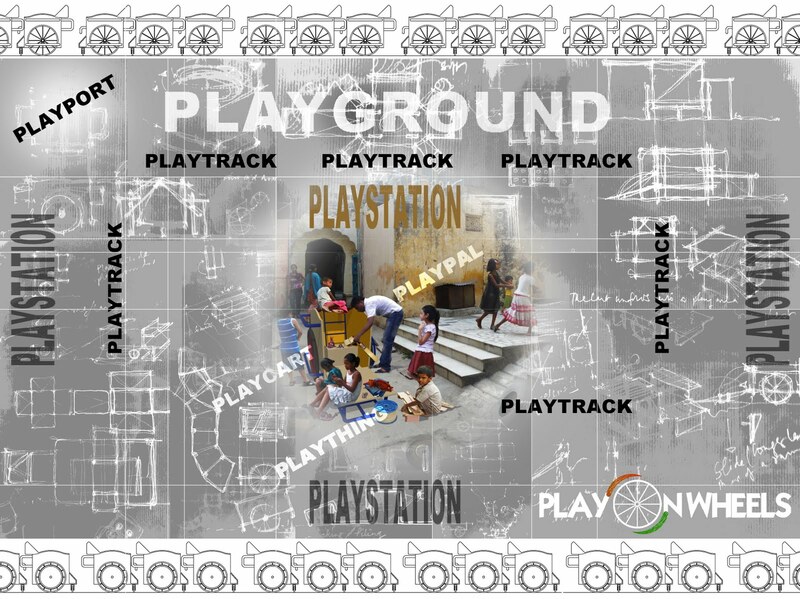 No attempt has yet been made to provide any alternate play spaces for children through planning and design at the local level. Concepts such as the Dutch Woonerf or the British Home Zone that redesigns the street to allow shared use by pedestrians, cyclists, cars and children are not even considered while designing new integrated townships for which architects and planners are flown in from all over the world. . The cultural obsession with parks as the only appropriate play space for children colors the perception of children as well. When we surveyed children’s choice of play spaces in north Delhi through schools (n=50), the top preferred place for play in the local area was parks. When we randomly surveyed play place preferences for children (n=31) across the five zones of Delhi in public places, we found parks to be the top recommended place for play within neighborhoods. When I worked with children in their middle childhood in Nizamuddin basti, the preferred play space for children were again planned and designed parks not only in their neighborhood but also within the wider local area. The children in Khirkee (n=50) also reported parks to be favorite play spaces. 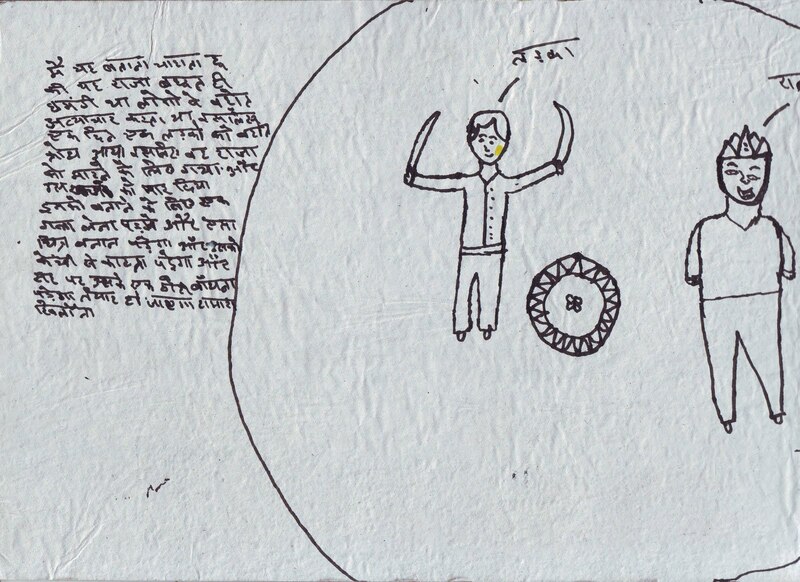 Our observational studies in Nizamuddin and Khirkee tell a different story. The group of boys who live in the DDA flats next to the Satpula area, and who we will call the “happy hip-hoppers”, when asked all reported a tiny triangular park in their neighborhood as their favorite play space. This park clearly alerts its residents that cricket and football are not allowed inside. This mixed gang of boys ranging in age from 9 to 15 years have no problem with that. They start their evening by playing cricket or football in the vast rough grounds of Satpula. Around 6pm they wind up their game, climb over the wall that separates their street from the open space and start playing in the streets which are practically traffic free. They sometimes enter the tiny triangular park which is the only tidy green patch in their neighborhood. They also play vertically using the blocks of flats, the many interconnected terraces, verandahs, and staircases as spaces for hide and seek. The entry into the triangular park is not always guaranteed; this place functions as an open air living room, neighborhood adults, women and men, actively claim this space for hanging out. The group of girls who live in the tiny slum pocket in Panchsheel Vihar reported the most number of games to be played in the DDA Park that allows them access unlike the larger Khirkee Park across the street. For these girls this park with its dirt top and corner green strips is the most coveted play place on earth. However as we found out by hanging out here, the girls do not come here everyday to play. They play in the narrow garbage strewn streets in front of their multi-roomed building or in the cramped terrace at the first floor level. So why do children as well as NGOs working with underprivileged children consider parks to be the best play space? For thinking adults in NGOs struggling to protect children from the hazards of living in the streets and deprivations of other poverty induced settings, one can imagine that play grounds or parks with attractive equipments for children may be perceived as safe and appropriate spaces to be a happy carefree child. 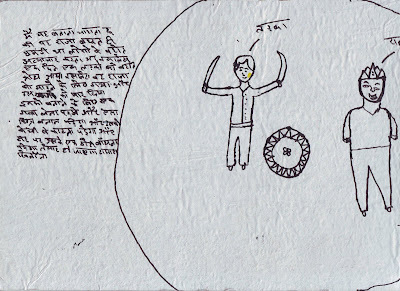 Even though this vision of universal childhood maybe informed by the versions of “innocent childhood”, what these caring adults forget is that the provisions that allow access to “underprivileged” children in Indian cities typically are often of the tackiest kind and children if allowed create their own playgrounds around the state provided equipments. String swings under slides, see-saws with planks of wood on the backs of park benches are but some of the innovations that I myself have witnessed in neighborhood parks in Delhi. What about children? Parents fear traffic and strangers in streets. Parents permit play in parks especially if other children from the neighborhood are also present. Children also cite the presence of other children as a major reason for wanting to play in parks. In middle class planned neighborhoods across Delhi, children are not visible at all in the streets. The few children who play in these streets come from nearby slums. 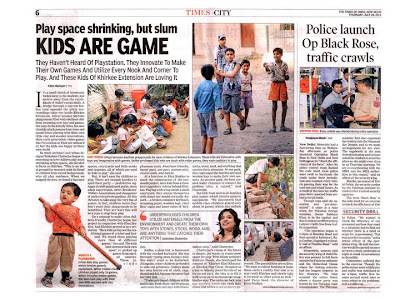 However in places like Khirkee and Nizamuddin Basti children actually play in the streets, squares and any open space near home more than they play in the planned parks they claim as their favorite places. Parks maybe the dream, but play really unfolds in the spaces near home and in particular the shaded narrow streets for majority of children living in Khirkee. This kind of play is the best form of social participation of children in community life. Because we do not know much about it, it is safe to say whether as a social worker, or planner or designer that parks are the best play spaces for children. If we really care for children we should start seeing how play really unfolds in urban space and provide for it across the entire public realm of our cities and not just in parks and playgrounds. I study children's use of urban environments to understand how places become meaningful for children. I live in hope that someday such knowledge will help us create more child friendly cities. KHOJ enabled us to study and creatively think about the landscapes of play at Khirkee village and its surrounding urban neighborhoods. 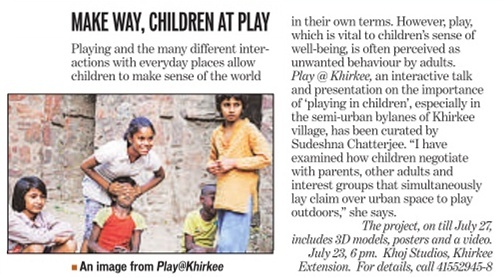 Several people worked with me at different stages to understand Play@Khirkee: Padma, Sourav, Yukti, Prerona and Risha. 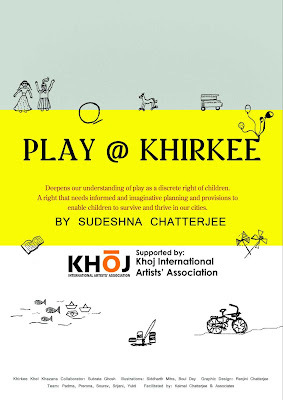 Subrata Ghosh collaborated with me to ideate Khirkee Khel Khazana; and Siddharth Mitra made some fabulous illustrations of children at play in Khirkee. I am indeed grateful to all of them for their support of this project. Sudeshna Chatterjee. Watermark theme. Powered by Blogger.